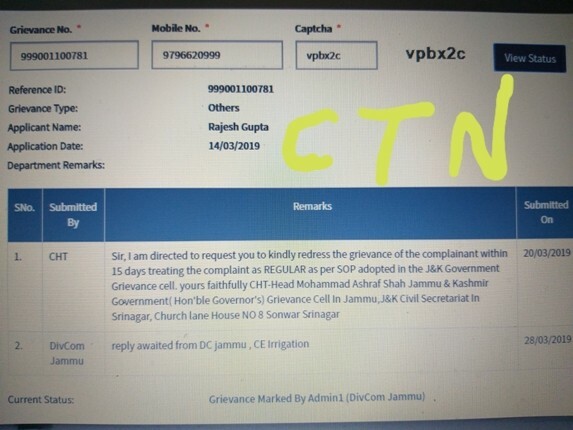 Jammu, April 15: Govt always speaks of work culture & transperacy but seems to be in air & CTN had dared to publicize with proof, the non compliances made by the officers. Every month so called Governors Grievance Cell publicizes that so many thousand of complaints received & so many thousands disposed but the situation on ground is different but who bothers is a question mark on the part of Governor itself...? Time & again Advisors also hear the grievances of public by causing expenditure on Govt by way of TA/DA etc etc but had they any time bothered to see whether previous grievance were sorted out as per the requirement or shown disposed only on papers. 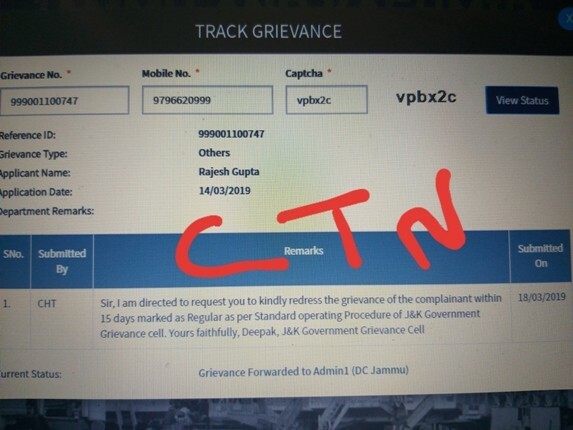 Live example of latest grievance's fate can be seen from the live proof from the snapshot that on which date the grievances were filed, on what day was forwarded to Div Com./DC & 15 days were over on which day & what was the status of poor grievance as on today at 3.00PM after exhaust of touching 30 days& what the Governors Grievance cell had done after exhaust of its time for disposal raises a finger on the working of Govt. Governor can now imagine that if grievance forwarded from his office for its disposal in 15 days is not bothered, what would have the fate of other innocent's requests...?